Set in an elevated position near the centre of Betws-y-Coed, this B&B is an ideal base from which to explore Snowdonia, and the rest of North Wales. This guest house in Betws-y-Coed offers bed and breakfast accommodation with a variety of different room types. 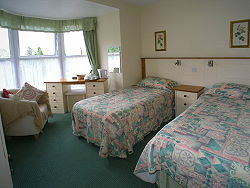 There are 13 rooms, 11 of which are en-suite. Double, twin, single and family rooms are available, including a family suite comprising 2 bedrooms, a lounge and a bathroom, that is very popular. There are 3 bedrooms on the ground floor, and walking parties of up to 28 people can be accommodated. See the rooms & tariff page for more information about the rooms and tariff. The refurbished lounge is ideal for meeting other guests, or planning your activities for the next day. You can relax and unwind in the comfortable surroundings. Breakfast is served in the dining room. There are separate tables for each room. A full traditional Welsh breakfast is provided, and lighter options are also available. Vegetarian options are available, and other special diets can be catered for with notice. The staff are Welsh speaking so at breakfast they can help you if you want to know how to say the local place names! Evening meals are available for large groups by prior arrangement. There are numerous restaurants, hotels and pubs in the village of Betws-y-Coed for an evening meal. Walkers are well catered for - packed lunches can be provided, and drying facilities are available. There are local walking guides to read in the lounge to help you plan your walk. Mountain bike storage is available for mountain bikers. To help you keep up with your e-mails, free Wi-Fi is available in the guest lounge for guests with their own laptops or other wireless device. 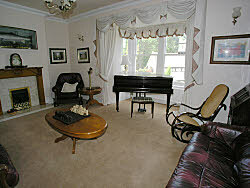 There are plenty of things to do during your stay in this bed & breakfast in Betws-y-Coed. 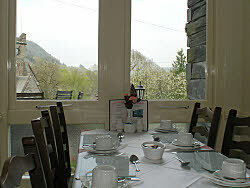 See the location page for information about things to do and see around Betws-y-Coed and Snowdonia. 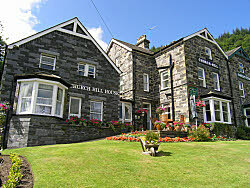 Content is copyright Church Hill House Bed & Breakfast, Betws-y-Coed, Snowdonia, North Wales, UK.